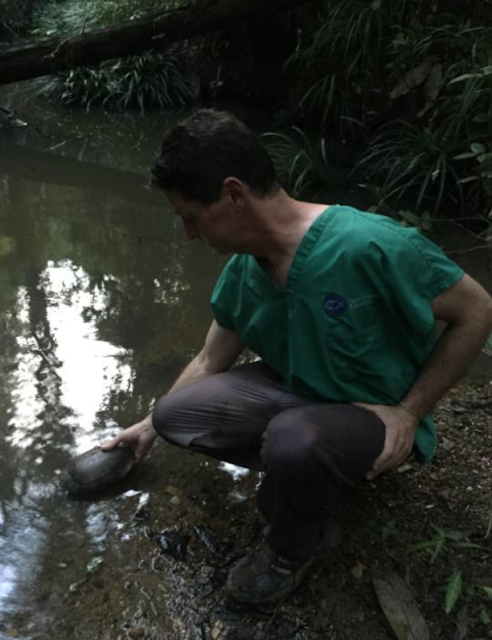 Aquarium head veterinarian Charles Innis, VMD, spent two weeks in the summer of 2015 working with a coalition of conservation groups to treat thousands of critically endangered Palawan forest turtles. The turtles had been intercepted from a poacher's warehouse and many were gravely ill. Innis will be speaking about the experience on Thursday, October 29 as part of the Aquarium's free lecture series. Here is a snippet from his journal detailing a release of some healthier rescued turtles. By the afternoon of June 29, we had categorized another four hundred twenty eight turtles as suitable for release. Sabine [Dr. Sabine Schoppe of the Katala Foundation coordinated all rescue efforts] had sent some of her students on reconnaissance for the previous two days to identify good release habitat. After evaluating and treating seven hundred something turtles over eight hours, we left the rehab center by van at approximately 3 p.m. on the 29th. Two locations were selected, and we divided into two groups, with approximately two hundred turtles to be released at each site. We drove to the north for about an hour to reach the known range of the species. We unloaded at a village and the crates filled with turtles were loaded onto sleds drawn by water buffalo. The buffalo were led by the local men, one man per animal, using a series of different clicks and grunts, each having a different meaning (start, stop, slow, turn, etc.). The sleds are incredibly effective, much better than wheels at navigating that variable terrain, going over stumps, etc. It is a simple looking design, but I am sure it has to be made in a specific way to remain balanced and flexible and intact. We hiked a little over two miles into the hilly forest (3.8 km according to our GPS) to the release site; it was dusk when we arrived. Full moon, bats, frogs and insects calling. The chosen location was typical habitat for the species — clay to mud bottomed, slow flowing, forested streams. We spread out along a few hundred yards of the stream and sent the turtles on their way. Because of the clay and mud, the water is not very clear, but I was still able to see the turtles for a minute or so if they remaining in shallow water. Their white neck ring shows well under water even when the rest of their body is not visible, of some biological significance I would guess. Most of them swam away fast, but I was able to get a photo of one re-emerging to take a breath, with just his nose visible above the water line, and two other turtles under water nearby. As always, release brings feelings of relief, happiness, satisfaction, and worry about the future of these individuals. I expect that this was the best night that these nocturnal turtles have had from quite some time, with space to move, cool water, soft substrate below their injured shells, no more injections, no more tube feeding. We hiked out in the dark wearing head lamps. We all worry about the ongoing threat of poaching. One of the film crew that is here (Dr. James Liu) gained some insightful but concerning information during some of his interviews over the past few days, including clear details of the presence of a well organized poaching effort for turtles and pangolins. For island species with restricted distribution, such poaching can easily lead to extinction. Innis will be speaking about the experience on Thursday, October 29 as part of the Aquarium's free lecture series. Read more about this shocking discovery of poached turtles and the international efforts to save them here and here. Turtle species around the world face threats to their survival. Support rescue groups, like the New England Aquarium's Rescue Team, and join movements in your community to help turtles. Learn more about what you can do to help turtles through our Turtle Rescue Team program. Dr. Innis is renowned for his knowledge and experience in treating turtles. His tenure at the New England Aquarium has given him ample opportunity, from caring for the resident sea turtles in the Giant Ocean Tank and freshwater turtles of the Amazon exhibits to the droves of cold-stunned sea turtles that are treated by our Rescue and Rehab team. 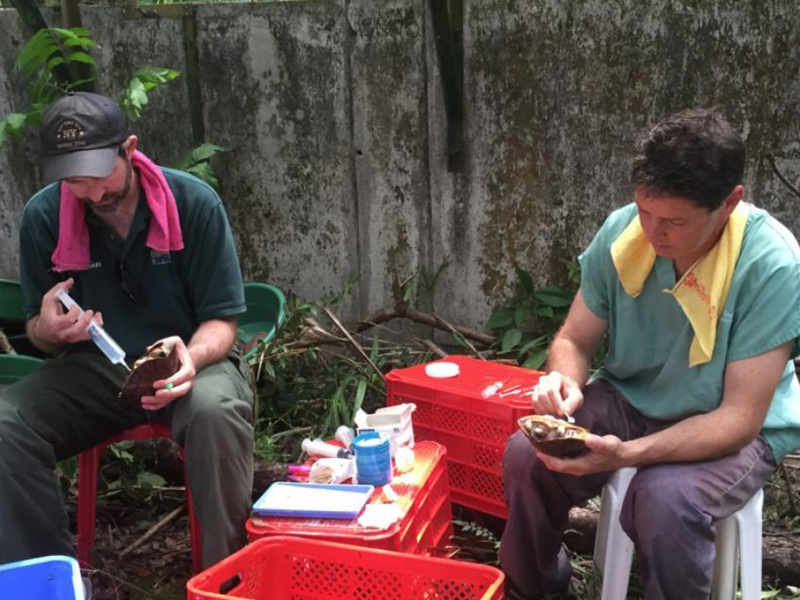 He even cares for endangered turtles in his spare time, lending his expertise to raise turtles at his home to support a species vulnerable to extinction. 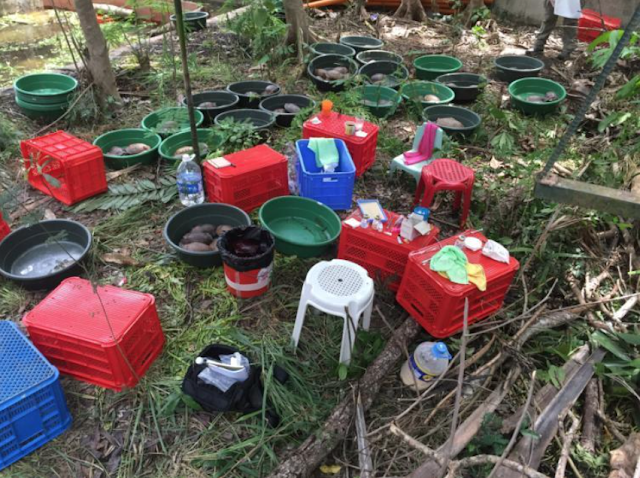 But his skills were put to the test after authorities in the Philippines raided a warehouse to discover thousands of turtles — including 3,800 critically endangered Palawan forest turtles (Siebenrockiella leytensis). That's more individuals than scientists thought even existed in the wild. Many of these turtles were gravely ill, showing signs of long term neglect. The survival of a species was now at stake, and the race was on to save it. Palawan forest turtles are endemic to Palawan Island in the Philippines. That means that's the only area in the world where you can find this species of turtle. 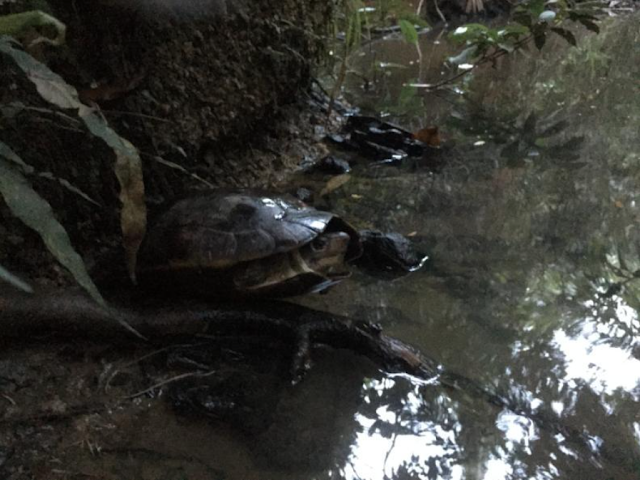 These turtles are nocturnal and they spend nights in muddy, freshwater streams feeding and finding mates. During the day, they climb out into burrows, which are easily raided by poachers. Taking this animal from the wild is wholly illegal. The species is protected by both local and international trade restrictions. Turtle rescue organizations sounded the alarm once the magnitude of this confiscation became clear. Many groups began the initial coordination and funding of rescue efforts including the Katala Foundation, Palawan Wildlife Rescue and Conservation Center, the Turtle Survival Alliance, the Turtle Conservancy, Wildlife Conservation Society, Wildlife Reserves Singapore, Ocean Park (Hong Kong), Turtle Conservation Fund, IUCN, and New England Aquarium. Local students also stepped up to help. Emergency pools and enclosures were created for these shy, solitary patients. Then veterinarians and technicians from around the world descended on the makeshift enclosures created in pools that had been used many years ago for crocodile breeding. Dr. Innis was one of the first veterinarians on the scene. Hundreds and hundreds of turtles had to be examined and triaged. The turtles suffered injuries to their feet and missing claws from being stacked on top of each other in the concrete warehouse where they had been held. They had ulcers on their shells and eyes, and many were severely dehydrated. Turtles that were in good condition were selected for rapid release back to their native habitat. Because this is a solitary species with aggressive tendencies, the extremely cramped conditions had been very stressful. Some turtles unfortunately died. 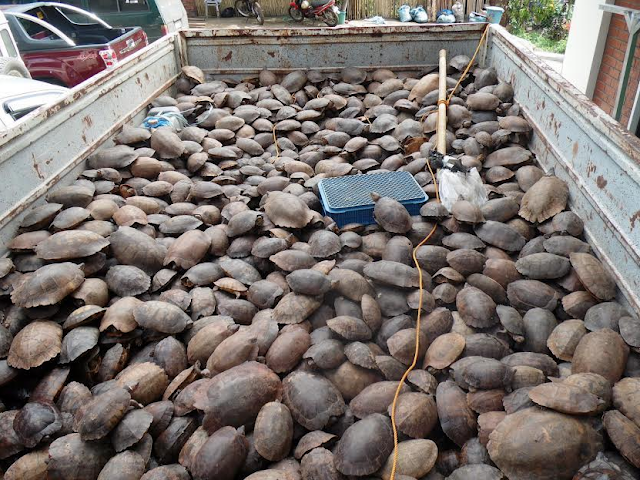 More than 2,000 turtles were released in the days after the confiscation. 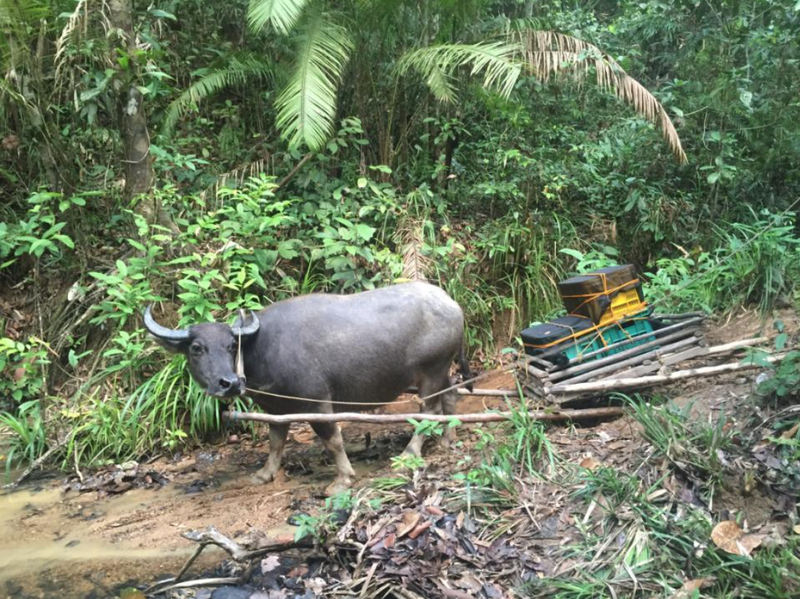 Teams drove the turtles several hours into the forest, then continued the trek on foot along narrow paths accompanied by water buffalo pulling the turtles on sleds. After the first week 1,000 turtles remained in rehabilitation because of the severity of their injuries. Treatments entailed fluid injections, medicines, ointments for skin and shell lesions and sometimes tube feeding. The small team of experts, including Dr. Innis, would perform exams and treatments on some days, and help with the releases on other days. Dr. Innis kept up this grueling schedule for two weeks, when a second wave of rescuers replaced the exhausted team on the front line. This herculean, international effort to save a single endangered species certainly illustrates the capabilities of dedicated conservation groups. But this is just one species of many that are threatened by poaching. Rescue groups have limited resources and may not be able to spread resources to address another crisis of this magnitude. 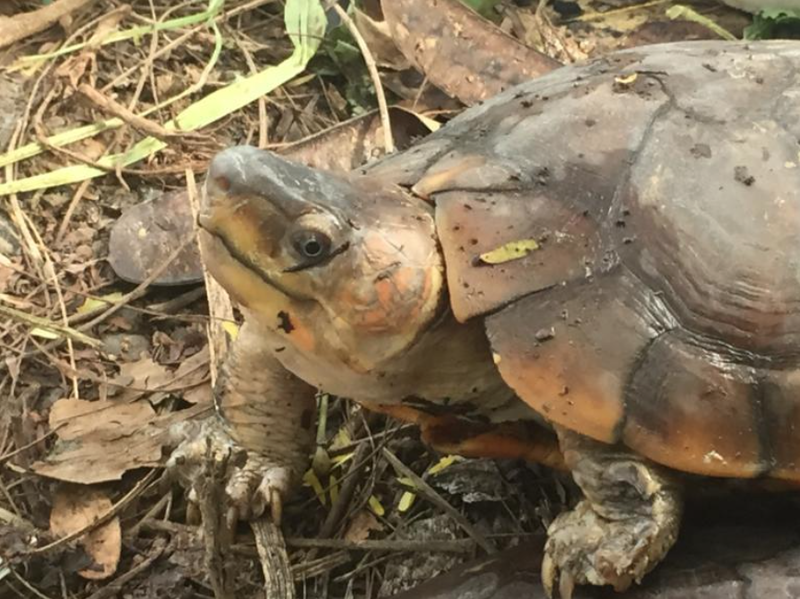 There may be still other warehouses of endangered turtles that go undetected. The question remains whether authorities can enforce protection measures so we can avoid a crisis like this one. 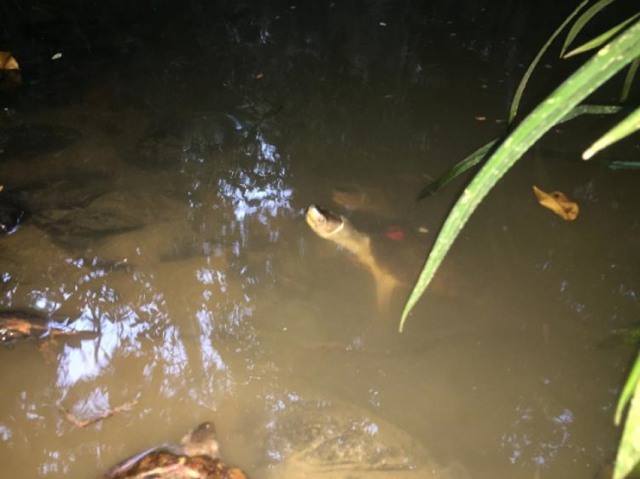 And only time will tell if the rescue, rehabilitation and protection measures taken by Dr. Innis and his colleagues in turtle rescue were enough to save the Palawan forest turtle. 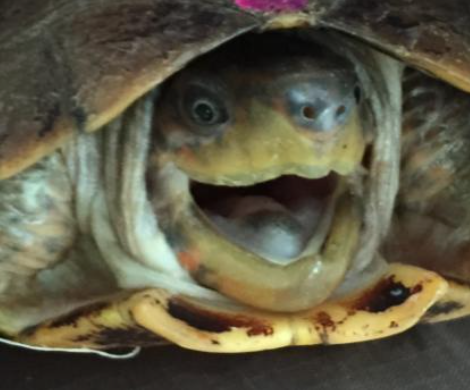 Read more about this shocking discovery and the efforts to save the turtles here and here. Turtle species around the world face threats to their survival. Support rescue groups, like the New England Aquarium's Rescue Team, and join movements in your community to help turtles. Learn more about what you can do to help turtles through our Turtle Rescue Team program. Stay tuned for more about this crisis from the perspective of Dr. Innis.